My2cents: "they'll kill the messenger so to speak". Reality Check: "Obviously this does not play well in certain circles"
clear point: "even though this plan for building the ישובים was to build חרדי ישובים against בן-גוריון ... but they don't care for the facts.."
"It’s time to admit that Arthur Balfour was a white supremacist — and an anti-Semite, too"
do you prefer Chaim Lieberman from the morgen journal! r u related to him? Yousef Munayyer is a political analyst based in Washington, D.C., United States. Munayyer was born in Lod, Israel. he isn't Jewish and he is not on the Forward editorial board. My2cents: "they'll kill the messenger so to speak". !? "and in house anti semites (zionists)"
Do you prefer the "editorial board" of the Jewish Press, the Hamodia, Hirshel Tzig, or (coming soon) The Oitzer !? Lazer: "Oif Alle Yiden Gezugt"
are you invested in israel ? Notice: please stop utilizing the "Epstein" Travel Co. name in anti-israel fair, "we specialize in trips to Israel and other services". “May you succeed in all that you do, May Hashem Prevent The IDF From Ever Putting You in Prison ever again"
"May God bless and keep the czar — far away from us. Amen!" "עיין שם "באריכות" שדחפו באמת הבנין שבידו את דברי האבני נזר ז"ל. ואכמ"ל בזה"
You can say he argued with him, it is permitted halachicaly to argue with any Achron, obviously if u get carried away thinking that you can rebuke a sar hatorah you are a fool, but halchicaly its no problem. 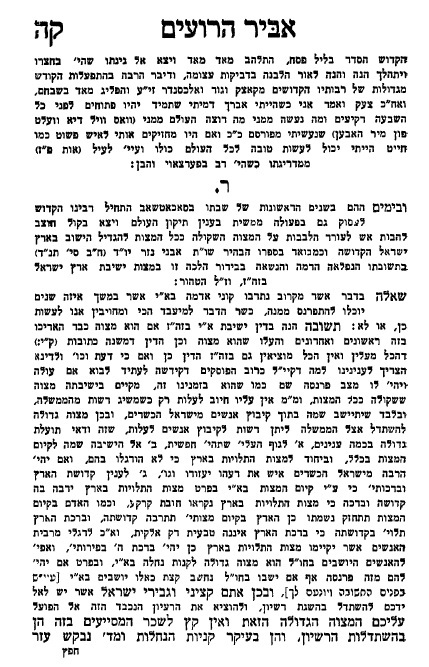 The Avnie nezer was not crowned the sar hatorah because some PR machine fabricated 10 books on him. I always marveled at the absolute idiotic and childish arguments about Zionism and yes Medina or no Medina,this argument was well and good 90-100 years ago when done in the SHTIEBLECH and MIKVAH'S of Hungary, Galicia, Poland, Russia,where the argument was about ideology and whether Jews should make an effort in going and building up the land. therefore to have an argument in the year 2017 about Zionism or yes or mo Medina is nothing but CRIMINAL INSANITY. Now when we say MEDINAS YISROEL it actually is the collective will and Representative and organization of the seven million Jews to run their country and above all to defend it from their blood thirsty neighbors,therefore what the heck has this got to do with ZIONISM? any normal Jew who does not support our seven million brothers and sisters in Eretz yisroel 1000% in their daily life and death struggle with their murderous neighbors is nothing but a RASHA and a ROTZEACH. Unfortunately we have so called Rebbes and thousands of Jews who not only don't support our God given state,but go out of their way to DELIgitimize and hurt her in every which way,these gangsters in Williamsburg have an organization called "NATRUNA" that spends hundreds of thousands of dollars yearly in print and media advertisement all over the world to deligitimize the state and stating openly that Jews have no right to their land. 72 years ago with had names for these traitorous murderous gangsters and it started with the letter "K"
I prefer Vatican City rather than Tel-Aviv..
Chaim your refutable speech is perennial, if you are aspiring to be the next speaker of the 'kenisia hagdola' this won't do it. try the Mosad's "Lügenpresse apparatus" you may be of benefit to them. Nussy gay shlufin. your monologue is theatrical and adds no tangible value to the topic discussed. Hungarian is a peasant language not rich enough to describe your foolishness in more than one word. the English language is culture's, and rich in enough words to stab and twist without any remorse. Érdemes felidézni a vitatható beszédedet, ha arra törekszel, hogy a "kenisia hagdola" következő előadója legyen, ez nem fogja megtenni. próbáld ki a Mosad "Lügenpresse készülékét", amire számodra előnyös lehet. köszönöm. C: "SHENSTE UND BESTE FUN YIDISHEN FOLK"
Hungarian is a peasant language not rich enough to describe your foolishness in more than one word. the English language is culture's, and rich in enough words to stab and twist without any remorse"
NY: "Just the sefer Aglie Tal got the Jewish world Tremble"
well, in the world I live it trembles more much more from the VM (and the 10 fabricated books) than from aglie tal.. or from the 'abir haroim'. Prince Charles blamed ‘foreign’ Jews for Mideast turmoil..
N.Yosef: "some local ruv who specialized in derush". ..it started with the letter "K"
"well, in the world I live it trembles more much more from the VM (and the 10 fabricated books) than from aglie tal.. or from the 'abir haroim'." can u please enlighten me of the Aglie trembles you had, can you share.. the aglie tal z"l seemingly didn't like me to much.. may be you do. Chey: "nothing but a RASHA and a ROTZEACH." M: "makes a mind of a torah yid tremble.." ? "GERMAN TRANSLATION" from the original in English. Ich bewunderte immer die absolut idiotischen und kindischen Argumente über den Zionismus und ja Medina oder keine Medina. Dieses Argument war gut und gut vor 90-100 Jahren, als es in den SHTIEBLECH und MIKVAH'S von Ungarn, Galizien, Polen, Russland geschah, wo das Argument war über Ideologie und ob Juden sich bemühen sollten, das Land zu bebauen und aufzubauen. Aber jetzt sind wir im 70. Jahr der MEDINA, wo fast sieben Millionen Juden leben, die die Hälfte aller Juden in der Welt ausmachen, und ich denke, wir sind uns alle einig, dass es das "SHENSTE UND BESTE FUN JIDISHEN FOLK" ist und diese sieben Millionen von unseren Brüdern und Schwestern sind Hunderte von Millionen von blutrünstigen mörderischen Muslimen ROTHZCHIM umgeben, die offen ihr Ziel der "LEHASHMID ULHAREG" erklären, jede Frau und jedes Kind, und diese sieben Millionen Juden danken Gott, errichteten eine Regierung und eine Armee, um sich zu verteidigen. .
deshalb ist ein Streit im Jahr 2017 über Zionismus oder ja oder mo Medina nichts anderes als KRIMINELLE WAHNSINNIGKEIT. Wenn wir jetzt MEDINAS YISROEL sagen, dann ist es tatsächlich der kollektive Wille und die Repräsentation und Organisation der sieben Millionen Juden, ihr Land zu regieren und vor allem, um sie vor ihren blutrünstigen Nachbarn zu verteidigen, also was hat das mit ZIONISM zu tun? Jeder normale Jude, der unsere sieben Millionen Brüder und Schwestern in Eretz nicht unterstützt, 1000% in ihrem täglichen Leben und im Kampf mit ihren mörderischen Nachbarn, ist nichts anderes als ein RASHA und ein ROTZEACH. Unglücklicherweise haben wir so genannte Rebben und Tausende von Juden, die nicht nur unseren gottgegebenen Zustand nicht unterstützen, sondern alles tun, um sie in jeder Hinsicht zu DELIgitimisieren und zu verletzen. Diese Gangster in Williamsburg haben eine Organisation namens "NATRUNA", die gibt jährlich Hunderttausende von Dollars in Print- und Medienwerbung auf der ganzen Welt aus, um den Staat zu deligitimieren und offen zu erklären, dass Juden kein Recht auf ihr Land haben. Vor 72 Jahren gab es Namen für diese verräterischen Gangster und es begann mit dem Buchstaben "K". and the uncultured use Google. try it you may like it, I'm sure it speaks the language you prefer. “I often said to Jews with whom I had dealings that, had I been a Jew, I would have been a fanatical Zionist. I could not imagine being anything else. In fact, I would be the most ardent Zionist imaginable… As a matter of fact, there was a very strong similarity between our attitudes in the SS and the viewpoint of these immensely idealistic Zionist leaders.” (Life Magazine, November 28, 1960)"
"פירושים יותרים. אני מאמין באמונה שלימה, שהוא לא היה מסוגל אף לחיות רגע אחד אם המדינה הטמאה הלז! שיותר מתשעים אחוז הם כופרים גמורים יושבים ומתריזים בארצינו הקדושה, ובוודאי לא היה יושב במושב ליצים בהמועצה הגדולים שלהם. וכבר האריך בזה הויואל משה זיל קרי בי רב"
"can u please enlighten me of the Aglie trembles you had, can you share.. the aglie tal z"l seemingly didn't like me to much.. may be you do." why are you quoting the reshab here???? Chaims,: "come to my shiur at the bies yisroel shtiblech every Friday night,"
So this is what its all about here to announce Chaim gives a shir in Agle Tal Friday night! long last. Chedder ruv: "he wanted to build a charadie yishuv in Palestine and get 1000's of charadie Jews to make aliyah....."
In his time it wasn't aloud for Jews to buy land, and he didn't bought any. All the monies collect by keren kyamys was held by them and they just recently I think gave the authority on their holdings land and otherwise to the state, I may be wrong I'm not an historian but you get the gist, There was no shtetlich nisach pollen going up there. Welcome to the state of Israel! we don't answer to our subjects, or to any higher authority. I don't have proof of nothing except that you're from the Y and lost generation, my proof is in your puddle. PS: he had 21 children most perished, those left I think got swept up in the pool of zionism, perhaps he should of pay attention. H' "but they don't care for the facts.... I hope my point is clear enough." According to the compromise approved by the KKL-JNF Board of Directors, the money will be transferred within three years. In return, the state will cancel the initiative for the taxation law of the Jewish National Fund. by Ariel Whitman. The board of directors of the Jewish National Fund approved the compromise reached in the ongoing crisis between the organization and the government. According to the compromise, the JNF will transfer NIS 1.8 billion to the state within three years and in return the JNF tax law initiative will be canceled. The Board of Directors is making the transfer of the money conditional on the State fulfilling its obligations under the previous agreement with it from 2015, which the Fund claims have been breached so far. This demand will likely cause certain difficulties in the ongoing negotiations between the fund and the state. The agreements are being reached after lengthy negotiations between JNF CEO Amnon Ben-Ami and his deputies Arnon Pelman and Shlomo Deri, and Prime Minister's Bureau chief Yoav Horowitz and Finance Ministry Director-General Shai Babad. According to the agreement, the JNF will transfer NIS 1 billion to the state by 2018, and another NIS 800 million in 2019 and in 2020. In addition to the agreement being formulated, KKL-JNF demands that the state waive additional demands from it at least until 2023, and the state, on the other hand, does not want to commit itself to such a distant date, arguing that the High Court of Justice ruled that a government can not force future governments Her term. The JNF also demands that the state appoint six of its representatives on the Israel Lands Council, while the state renounces this demand. The saga began when the state demanded 2 billion shekels - the first billion in 2018 and the second in 2019 - the JNF did not agree to this demand, and the government in response began to promote a special tax law that cancels the tax exemption of the fund . The Finance Committee passed the bill for second and third readings. If no final agreements are reached between the parties, the bill will be passed to the plenum in the near future. has a son in law that was a mizrochi/zionist????? Thanks for the translation,you did an excellent job.
" there was rumors once that not every thing he says in the name of his father checks out true,"
"I don't have proof of nothing except that you're from the Y and lost generation, my proof is in your puddle"
Rabbi Sender Deutsch writes about a lengthy discussion he had with the SR in regards the the Shem M'shmiel to the effect of what "shmoy poy" writes, he is correct if you believe Rabbi Deutsch. LE: they could buy land. 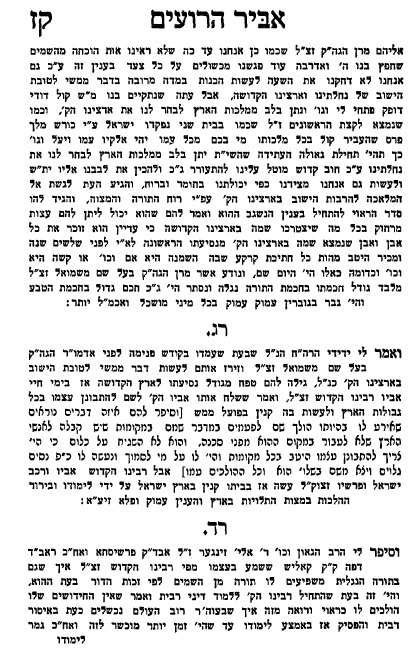 "Rabbi Sender Deutsch writes about a lengthy discussion he had with the SR in regards the the Shem M'shmiel to the effect of what "shmoy poy" writes, he is correct if you believe Rabbi Deutsch." Sender Dietch was not embarrassed to admit for his close buddies that he feeds lies for the masses.... his arrogance gave him a pass that the masses he served are peasants that anything he delivers will be eaten out of his plate. 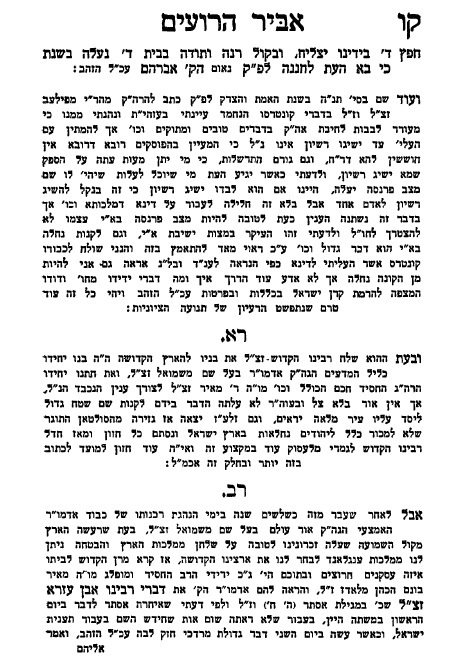 What makes Satmar ruv a man deomar to analyze the profile of the giant of machshova like the Shem Mishmiel ? Does it bother you also the english ads in NYT and on all radio channels of the official satmar hate outlet Natronoai, who explain the midrash of the 3 oaths for all gentiles and Jewish bnai nidah? Laz: "all your talk is nonsense they could buy land"
No he didn't. Eichmann himself testified in court that: "HE DID NOT PUT THE SR ON HIS LIST." you just regargling your stale vomit of yesteryear. Rie'sling: "What makes Satmar ruv a man deomar". well said, sock it to him. CHAIM: "maybe try to write in Hungarian"
Hungarians are peasants look what a mess they make on their rebbe's yartziet, wóuld they do it by the Shem M'shmiel? I doubt it. Big H: "the British Government appropriates Eretz Yisroel for עם ישרא-ל". CHAIM: "it's nothing but CRIMINAL INSANITY." Israeli chauvinist pigs, are equal opportunity racist's, acting like Nazis on Pious Haradim! as well as on Reform "Ladies & Gentleman" ! "Israeli security guards roughed up the head rabbi of the Reform movement at the Western Wall, ripping his suit jacket and shoving a can of mace in his face"
And the mizrochi/zionist had children who are a shine to the Jewish world! k"h.
Did someone actually give you a psak din that you had to write ישרא-ל with the hyphen? If so, please tell us who paskened like this. Sheesh. Pit this is the way Hirshel writes them ok, when in Rome do like the Romans do, that's a universal pesak even in shulcun Urich. HT: "Their next move to discredit these facts"!? "How the holy Sochatchover's celebrated... 100 years since the Balfour Declaration"
"Yated Neeman Editor blames growing global anti-Semitism on the State of Israel. He explains that not only hasn’t Israel solved the problem of anti-Semitism, but it is a contributing factor".!!! BP: "why are you quoting the reshab here????" Hirshel: "I know real Lubavitchers aren't into Zionism too much, but here's my 2 cents." said: "So hitler came and wiped out all jews from Germany and the colonies of Israel were saved.."
The Jewish autonomy "oblast" in Birobidzhan Russia ,the Jewish Bundist'n Land. estb. in 1934 (1928) by Lenin, all Jews who went there got "saved" too. under the auspicious of the infamous Jewish "yevsakyeis" the (anti) Zionists !!! ACHTUNG! BEWARE! DANGER AHEAD !!! "Under Israeli law, even if the property owner living abroad allows their relatives to live in the home, it can still be taken over as absentee property. JNF/KKL and its subsidiary company called Himnuta seek out these situations and attempt to use the courts to take the homes." !!! My2 said: "At the event he showed them a אבן עזרא in מגילת אסתר saying.."